Valiathura is a fishing hamlet located in the suburb of the capital city of Kerala. This place had a huge significance as a port in the region. With the coming of a port in Kochi, it gradually lost its significance as the commercial port. Now, it is used as a fishing port by the locals in the area. It is famous for the pier that was built about 59 years ago. During its heydays since its grand opening in the year 1956, up to 50 cargo ships used to anchor in this port at a time. Valiathura pier was commissioned and dedicated to the nation in 1956 by the advisor to the Rajapramukh Dr. P.S. Rau. At that time, it was the only port along the South Kerala coast. Hence, the pier used to be busy with big and small ships bringing materials from far off countries. The pier in the port premises has a length of 703 feet. The warehouses situated near the pier used to store the cargo offloaded from the boats anchored in the port before their transport to various parts of the country. The pier is made of 127 pillars made of concrete. When it was operational, the port had four 3-tonne cranes and one 10-tonne crane to offload cargo from the vessels anchored in its deck. The only drawback this port was its presence near the shallow water sea. Being a shallow water port, the bigger cargo ships had to be anchored in deep sea and the cargoes in them had to be transported to the port in smaller boats. With the setting of deep water port in Kochi, Valiathura lost its significance. Hence, Valiathura port became a dead port. Due to the constant disuse of the port infrastructure and constant exposure to salty winds, the structures holding the five cranes developed rust. This forced the authorities to dismantle the cranes and sell them as scraps. The warehouses attached to the port were later rented out to industrial units. As the rails that were used to run the trolley for transporting cargo remain unused for a long time, they got rusted due to exposure to the salty conditions. Only the pier remained undisturbed even after constant disuse on the sea shore. However, the structure strength got reduced over a period of time. Now, this structure is used by the fishermen to launch their catamarans during the monsoon season when the sea remains rough. After the launch of their catamarans, the fishermen jump into the sea and swim to them. People in the vicinity of Valiathura prey on fish by a process called angling. They use this pier for angling the fishing net from it. This place witnesses normally waves of one metre height. During the monsoon season, the height of the waves exceeds four metres. Hence the locals have learned the trick of keeping the net open for the fishes to get trapped during the movement of waves towards the sea shore. The locals have deputed many anglers at strategic points on the pier to hold the hook. Despite the passing of time and the advent of sophisticated angling gears, the local fishermen use the traditional method of angling to catch fish from the sea. The anglers usually are labourers and daily-wage workers. They are trained to adjust the hooks and loosen it to attract the prey. This is the reason why people call now the Valiathura port as fishing port now-a-days. The number of hooks that are used for the angling operation ranges from 18-24 on a single line. Some hooks need not have any bait on them to attract the prey. Anglers regularly pull and loosen the net in the water to bring in the prey. The line is nothing but the fishing net that let the water current pass through it so that it reaches the hook anchored in the sea. Since the water current is towards the shore, the anglers use heavy iron weights to anchor the line in the sea. Using this system, people catch different types of fishes. Some of the fishes that get trapped include malavu, kanava, para and kozhiyala. Tourists thronging in that area are not allowed to venture into the sea through this pier beyond a certain point. A few years ago, a weakened pillar supporting pier developed cracks due to the constant attack by high waves. After some time, it completely collapsed pushing a 20 square foot platform into the sea. Recently, a portion of the sidewall also caved in to the powerful waves lashing at the structure. Hence, the pier has become a dilapidated structure over a period of time. This is the reason the locals and authorities manning the structure don't allow the tourists go beyond a point. The Kerala government's Harbour Engineering Department had started working on a project to reconstruct and reinforce the existing pier in the port in 2007. Currently, the work is going on in full swing. Now-a-days, the tourists use a portion of the pier near the shore to get near the sea and catch the beauty of the sea. It is worthwhile to climb the pier to spend some time enjoying the serenity of the sea. 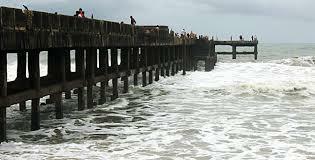 Valiathura pier is an existing structure in an old port near Thiruvananthapuram International Airport in the state capital city of Thiruvananthapuram. It used to be a fully operational port about 30 years back. This port was located near the shallow water sea. Hence, the large cargo ships had to be anchored in the deep sea and cargoes had to be transported in small boats to the port. Due to this reason, the operational costs were high in this port. This forced the authorities to make a permanent alternative port near Kochi with large ship berthing features. Since the commissioning of Kochi port, this old one lost its significance. Now, people in the region use it as a fishing port. During monsoon season, the piers are being used by the locals as launch pad for their catamarans to escape the rough sea near the shore. People also use the pier for catching the fish by means of angling. However, the living anglers man the strategic points on the pier and adjust the hooks of the line to catch the prey. Due to the dilapidated state of the pier, the tourists are not allowed venture into the sea using it beyond a point. The visitors can use a part of the pier that is nearer to the shore to snap the beauty of horizon using their cameras.